According to a new market report published by Transparency Market Research titled Industrial Gloves Market - Global Industry Analysis, Size, Share, Growth, Trends, and Forecast, 2016–2026, the global industrial gloves market is expected to reach a value of US$ 15,271.1 Mn by 2026. In terms of value, the market is estimated to expand at a CAGR of 13.9% during the forecast period from 2018 to 2026. In terms of volume, the industrial gloves market in North America and Asia Pacific is projected to witness the highest growth during the forecast period.The market witnessed considerable growth due to increased demand for industrial gloves in pharmaceutical and automotive industries. The industrial gloves market is influenced by market dynamics with the prime driving factor being increasing growth in the pharmaceuticals, chemicals, and food industries market, apart from increasing awareness regarding worker safety and regulating bodies mandating the use of industrial gloves.On the other hand, one of the main challenging factors affecting this industry is local and inexpensive products. However, the industrial gloves market is expected to provide opportunity of expansion in untapped markets. In 2017, based on product type, disposable gloves accounted for the largest market in the global industrial gloves market with a CAGR of 14.1% due to the fact that disposable gloves are widely used as they are most economical in terms of price. In terms of end use industry, automotive & transportation segment is anticipated to expand at a CAGR of about 14.5% in terms of value. 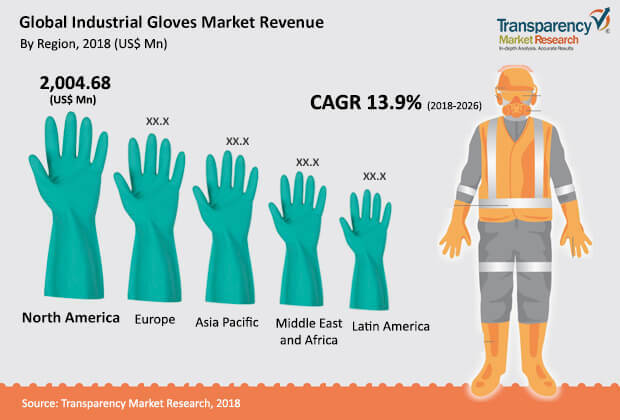 By geography, North America, Europe, and Asia Pacific are expected to continue their dominant share in the industrial gloves market with more than 89.67% share. Some of the major players in the global industrial gloves market are 3M Corporation, Honeywell Safety Products, Ansell Ltd., Lakeland Industries, Semperit A.G., Showa Group, HartalegaSdn. Bhd., Dipped Products Plc., and Uvex Group. The industrial gloves market is segmented as below.